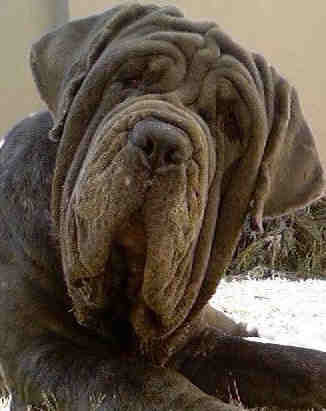 Cane Corso (pronounced cah nay cor so) originated in Italy from molossers (a giant type of dog.) The Romans used the dogs in warfare. Their descendants were used on farms to herd cattle and pigs. 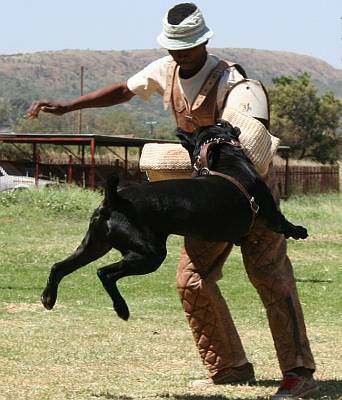 They have been used for the sport of bear-fighting. 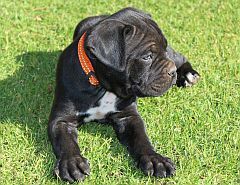 The breed nearly died out, but in recent times, through breeding corsi with similar breeds like the Neapolitan mastiff, a new type of cane corso exists. They are strong, muscular, athletic dogs whose intimidating appearance makes them good guard dogs. They will protect their owner, so firm handling is needed. Puppies should be well socialised, otherwise the adult dog may not accept other pets, and may be suspicious of people. Breeders must ensure that people understand the breed before selling puppies. 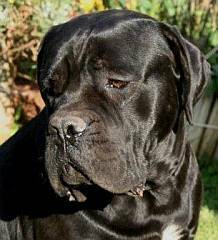 Temperament: The true cane corso has a stable temperament. They should not be aggressive without reason. They need an assertive owner who can dominate them, otherwise this strong dog can dominate the owner. They are intelligent, trainable and enjoy being with their owners at all times. Colour: The most common colours are black, and fawn. The black can appear bluish with a grey muzzle. Fawn can vary from pale fawn to red with a black muzzle. Brindle is also acceptable. They may have white markings on the chest. Height at shoulder: 62–72 cm (24–28 in). Females tend to be smaller than males. Weight: 40 to 75 kg (88 to 170 lb). Breeders used to crop the ears and cut off the tails to make the dog look more ferocious, but these practices are now frowned upon. The life expectancy of a cane corso is 10 - 11 years. It's not the length of a dog's life that counts, it's the quality. Same with humans. As the poet says, "We've only one life, 'twill soon be past; only what's done for Christ will last."